Filed Under Blackburn Rovers F.C., Chelsea F.C., Manchester City F.C., Manchester United F.C., Paul McGuinness, Premier League, Southampton, Stoke City F.C. Ashley Fletcher has been in red-hot form so far this season. Manchester United remain firmly in control of the Barclays U18 Premier League after they beat Southampton on Saturday morning. 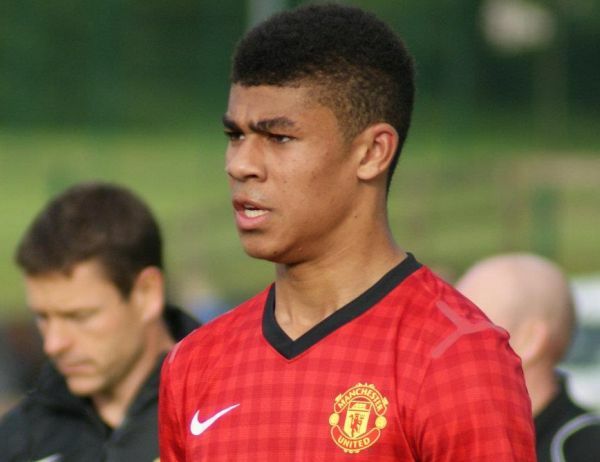 Ashley Fletcher netted a double for the Red Devils as they sit top of the northern group with 18 points to their name after just seven games. Fletcher has been in scintillating form this season and has now scored seven in the same amount of games for Paul McGuinness’ side. Chelsea’s under 18s won away from home for the first time this season by beating Blackburn Rovers convincingly. “We were very good going forward but there’s a lot to work on defensively,” said Chelsea coach Ade Viveash. “There was some great attacking play though and it was a game where the players will have learnt a lot in terms of their development. “We’ve got some exciting attacking players with a lot of pace. Dominic Solanke’s only 16, he’s got two today and made some great runs. Kasey Palmer played in the Number.10 role and did really well in between the gaps but we need to be more solid at the back. “We’ve got a lot of work to do in terms of developing in defensive situations, not just the defenders, but as a group of players. Tottenham Hotspur remain the only team to maintain a 100% record as they sit second in the southern group, albeit haven’t played as many games as other sides in the division. They beat Stoke City 4-0 away from home on Saturday afternoon as Emanuel Sanoupe netted a hat-trick and Nathan Oduwa also got on the scoresheet. Fulham remain unbeaten and in impressive form after they beat Bolton 4-1 away from home. The reigning champions enjoyed a Moussa Dembele hat-trick after Solomon Sambou put them ahead early doors. Man Utd 2-1 Southampton, Middlesbrough 3-2 Arsenal, Newcastle 1-2 West Brom, Stoke 0-4 Spurs, Sunderland 1-0 West Ham, Blackburn 2-5 Chelsea, Bolton 1-4 Fulham, Everton 1-0 Leicester, Liverpool 3-3 Norwich, Man City 2-4 Reading.